What is the most innovative and sustainable way to approach space research, education, and commerce beyond low Earth orbit? 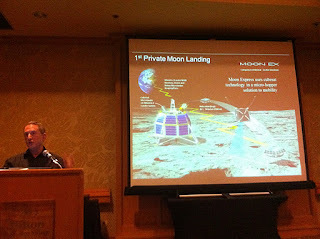 Those were the themes of the recent International Lunar Research Park (ILRP) Leader's Summit, which I had the privilege of attending thanks to generous support provided by the Silicon Valley Space Club and State of Hawaii. While last year's meeting dealt with identifying the "what", this year's meeting focused on the "how" aspects of those themes in the context of a research park. Developed first as a terrestrial prototype in Hawaii, this research park could later expand to the Moon. 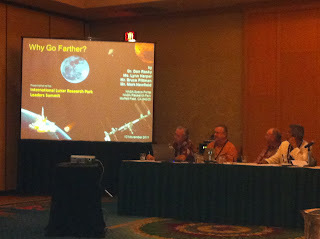 You can learn all about the concept on the ILRP website, the April 2011 ILRP Exploratory Workshop website, or Bruce Pittman's Fall 2011 Ad Astra article titled "Been There...Never Done This!". Ever since Obama quipped, "We've been there before" in reference to the Moon during his April 2010 speech cancelling the NASA Constellation Program, the lunar research and exploration community has been scrambling to erase the notion that the Moon is a 'been there, done that' kind of world. 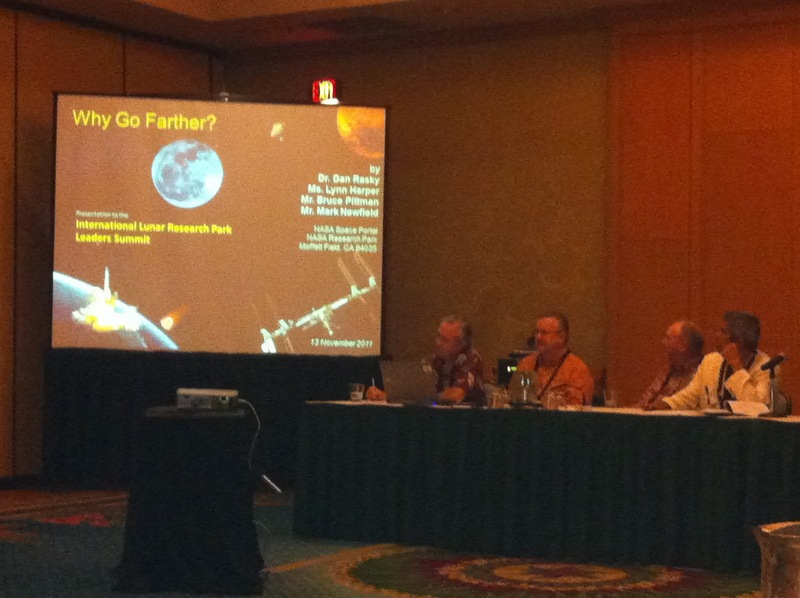 It's no secret that I'm a big fan of getting humans to Mars as soon as possible and perhaps even eventually terraforming it, but ever since I attended the Lunar Science Forum last year I've gained a greater appreciation for the added value of a more integrated exploration strategy involving both the Moon and Mars. While this reasonable idea is favored by many, it is not currently in political favor, and therefore NASA suffers from having an unclear direction. Addressing this concern, "The 'Moon' is not a 4-letter word," became one of the most memorable mantras for the ILRP summit (kudos to Bob Richards for thinking of it). Frank Schowengerdt kicked off the summit with an overview of the ILRP concept as an international public-private research park consortium based in Hilo, Hawaii utilizing the PICSES field site on the flank of Mauna Kea. Over a period of years, this would lead to a lunar "robotic village" and a permanent human outpost on the Moon. Benefits would be many and include STEM education, commercial opportunities, high tech jobs, resource/energy conservation technology spin-offs, etc. Michael Marlaire then briefed attendees on the great success of the NASA Research Park (NRP) located at NASA Ames in the heart of Silicon Valley. The NRP began in 1998 and now has over 80 partners, the largest of which is Google. It has produced many economic benefits and spawned a host of successful startups like Tibion, Apprion, Bloom Energy, Nanostellar, Benetech, SkyTran, and The National Disaster Resiliency Center. Two National Research Council reports in 2001 and 2009 feature the NRP. The basic idea is that the ILRP could be a NRP-like research park spurring innovation towards lunar development. The value proposition of the ILRP was a big topic as well. 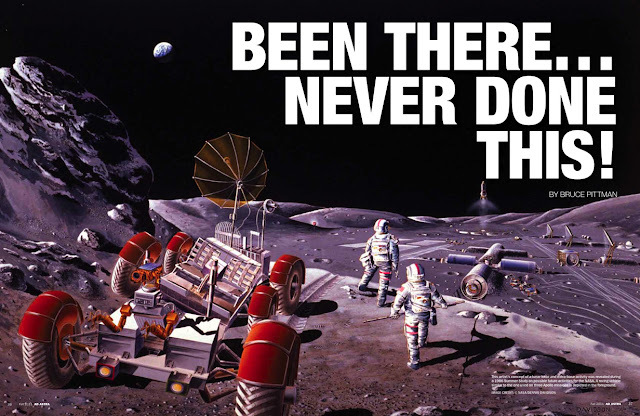 We discussed the business case for extracting resources from the Moon, marketing aspects why potential customers should embrace such a plan, and what unmet consumer needs the ILRP could fill. Lynn Harper of NASA's Space Portal gave a good talk on her reasons for exploring space in the first place: 1) prevent death of our species, 2) provide warning for natural disasters, 3) medical breakthroughs improve life, 4) scientific discovery, 5) promote safety, 6) generate new wealth, 7) inspire and innovate, 8) education, 9) benefits always begin on earth, 10) promote peace. Video game designer Henk Rogers eloquently pointed out that "the technology we need to survive on another planet is exactly the technology we need to survive here." Representatives from Hawaiian Airlines, Boeing, NORCAT, Google, and others also spoke on the spin-off potential for innovation with manufacturing, sustainability, and educational opportunities. Dan Rasky and others argued for the potential of adventure tourism to advance the ILRP terrestrial prototype business case too. The common theme was that extraordinary endeavors tend to yield extraordinary solutions with benefits that far outweigh expectations. 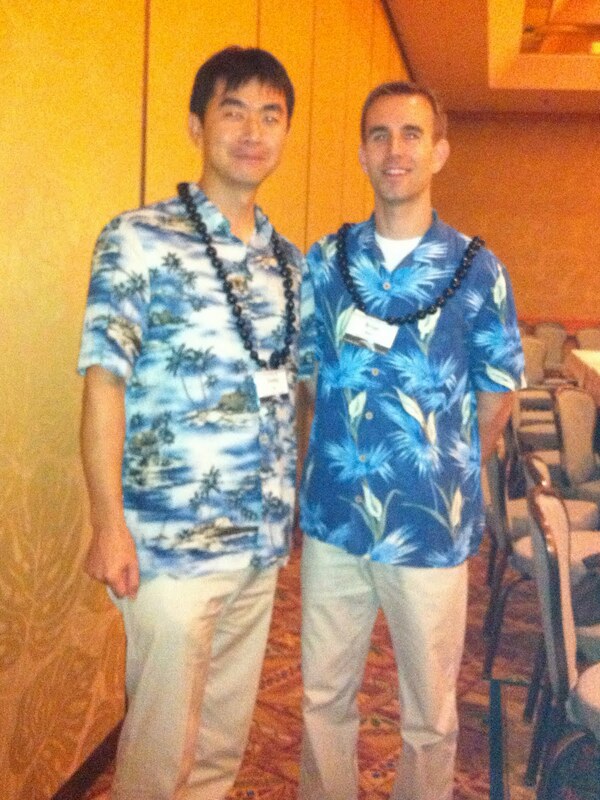 Finally, we discussed the need for and benefits of strong strategic alliances with the local Hawaiian community. After all, one can argue that colonizing space is really just an extension of the seafaring Polynesian culture. The single biggest technical driver for the ILRP is in-situ resource utilization (ISRU), and there were many sessions at the conference devoted to this subject. NASA's ISRU Managers Jerry Sanders and Bill Larson spoke on the importance of analog field testing to prepare for human exploration beyond low Earth orbit. One can only develop technologies in the laboratory so far, which is why testing in remote, stressful field environments is so critical. Sanders contrasted the difference between mission-based analogs like Desert RATS, NEEMO, or Pavilion Lake and hardware-based analogs like that done at Hawaii's PISCES field site. Larson described how the PISCES site fulfills all of the requirements for a good analog test site in terms of geology, weather, infrastructure, and support. Past field campaigns in 2008 and 2010 (pictured above) yielded a wealth of information that has led to the near-closing of the ISRU loop. The next installment is set for summer 2012, which will be a lunar polar mission dress rehearsal with a possible Mars ISRU power/propulsion demonstration. I later gave a presentation in a breakout session on ways to merge mission- and hardware-based analog test scenarios together at the PISCES site based on my experiences at FMARS and MDRS. Rob Kelso summed up the ISRU drivers in his keynote address on the need for a systems of systems approach to develop the necessary interoperability standards and interfaces needed to live off the land on the Moon or Mars. Once these technologies are tested on Earth, they will be taken to the Moon, initially via robotic and teleoperated systems. Spurred by the Google Lunar X PRIZE (GLXP), a fleet of robots will descend upon the lunar surface within the next few years. Alex Hall, who leads the GLXP as its Senior Director, briefed us on the progress of GLXP teams as they scramble to win the prize before it expires at the end of 2015. Discussions centered around ways these robots can work together to establish the lunar robotic village envisioned by the ILRP. In his talk, Clive Neal discussed having some standard scientific payloads that GLXP landers could carry such as seismometers - a subject very near and dear to my heart. The Shackleton Energy Company presented their ambitious plans to land humans on the moon by 2019 with zero government funding and to establish a propellant depot there by 2020. Alan Stern (pictured left) of the GLXP team Moon Express gave a keynote address on today's new commercially and scientifically driven paradigm for lunar exploration. All-in-all, this year's ILRP summit was a worthwhile experience that I am thankful to have had. While much work lies ahead, I am confident that the tide towards a balanced exploration approach including both the Moon and Mars will prevail. While NASA has demonstrated a strong interest in the ILRP program, it's too soon to tell how completely the agency will back the project. That's one reason it's being developed as a multinational public-private partnership that is not reliant on any one space agency. As a bonus, I got to meet newly minted JAXA astronaut Kimiya Yui at the ILRP meeting (pictured right). He sat next to me during a technical working group session and later gave a keynote on the challenges of exploring the Moon. We had a nice conversation about his two years of ASCAN training with NASA. He had seen my FMARS/MDRS presentation and said that with that kind of experience under my belt, I should have a leg up in the astronaut application process. It's always nice to hear such compliments!